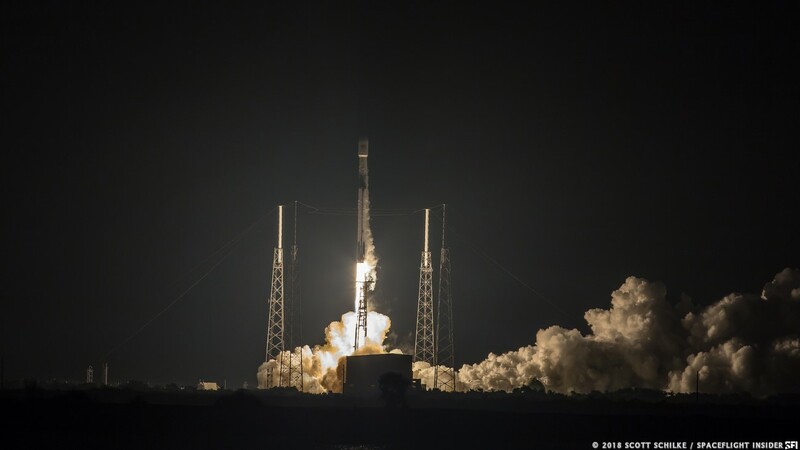 CAPE CANAVERAL, Fla — SpaceX’s rapid-fire launch cadence continued July 22, 2018, with the early-morning launch of the company’s second Block 5 Falcon 9. The rocket placed the Telesat-owned Telstar 19 VANTAGE communications satellite into a geostationary transfer orbit. Liftoff from Cape Canaveral Air Force Station’s Space Launch Complex 40 took place at 1:50 a.m. EDT (05:50 GMT) at the opening of a four-hour launch window. The weather was predicted to have a 60 percent chance of acceptable conditions with evening rain showers lasting longer into the night than typical for the area. However, thick, cumulus clouds stayed far enough away from the area to allow for an on-time flight. The countdown for the launch was smooth and quiet. Because this is a Block 5 Falcon 9, the fueling of the 230-foot (70-meter) tall vehicle began a mere 35 minutes before liftoff. It started with the loading of rocket grade kerosene into the first and second stages of the vehicle and liquid oxygen in the first stage. Then some 16 minutes before launch, pumps began filling the second stage with liquid oxygen as well. Seven minutes before the countdown reached zero, the nine Merlin 1D engines at the base of the Falcon 9’s first stage began conditioning themselves for launch. Six minutes later, the propellant tanks pressurized to flight pressure. Forty-five seconds before liftoff, the SpaceX launch director verified the vehicle was “go” for launch. 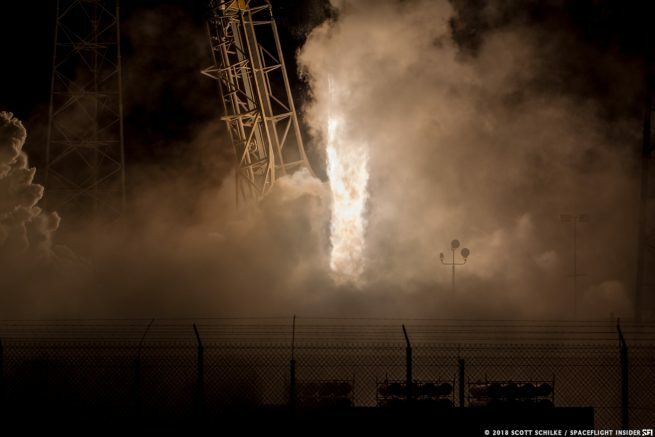 At three seconds, the nine Merlin 1D engines ignited and began spooling up to full power. Once the computer verified all the engines were healthy, the launch mount released the Falcon 9. It’s nine engines, generating some 1.7 million pounds (7,600 kilonewtons) of thrust, began pushing the whole stack upward and into the sky toward the black of space. Within just over a minute the vehicle had passed the speed of sound and the moment of peak mechanical stress on the rocket. About 1.5 minutes later, the Falcon 9’s first stage finished its job and its engines stopped firing, as planned. Separation of the first and second stages occurred several seconds later at about two minutes, 33 seconds into the flight. The second stage’s lone Merlin Vacuum engine ignited about two minutes, 34 seconds after leaving Florida to continue pushing it and Telstar 19 VANTAGE toward a parking orbit. Next, because it was no longer needed, the clam shell-like payload fairing was jettisoned three minutes 40 seconds after launch, exposing the spacecraft to space. After about six minutes of burning toward space, the planned parking orbit was achieved and the second stage’s engine cut off as planned. This coast phase lasted about 18 minutes. Meanwhile, the Block 5 first stage continued on a parabolic trajectory after it separated from the second stage. Using cold gas thrusters, the booster turned around by nearly 180 degrees to prepare itself for an entry burn some six minutes into the flight. Lasting only for about 20 seconds, this burn cushioned the vehicle as it slammed back into Earth’s atmosphere. Over the next several days, SpaceX engineers out at sea near the drone ship will work to safe the rocket and tow it back to Port Canaveral where it will be evaluated, refurbished, and prepped for another flight. Back in orbit, the second stage fired its single engine for a second time at the conclusion of its coast phase. This 50-second burn placed it and the satellite payload into a highly-elliptical geostationary transfer orbit. 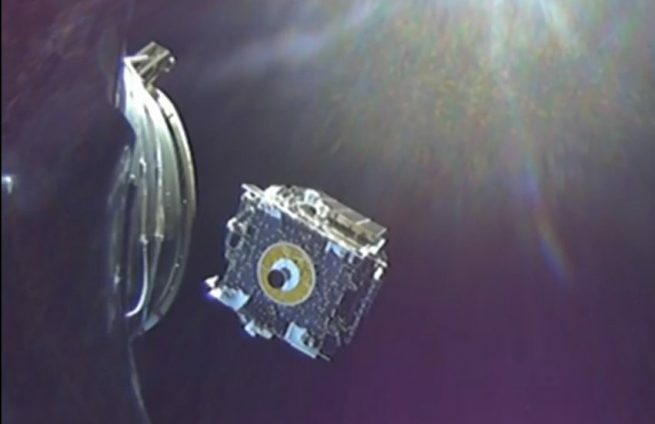 The spacecraft separated about five minutes later at a mission elapsed time of about 33 minutes. Using onboard thrusters, the SSL-built Telstar 19 VANTAGE satellite is expected to circularize its orbit over the coming weeks and months at about 22,300 miles (35,900 kilometers)—geostationary orbit. It’s orbital slot is expected to be the 63 degrees west location where it will provide Ku- and Ka-band coverage between northern Canada and South America. Additionally, it is designed to provide coverage over the North Atlantic Ocean for aircraft and ocean-going vessels. Based on the SSL 1300 platform, the spacecraft is about 15,600 pounds (7,076 kilograms) and is designed to operate for about 15 years. It’s two solar panels are expected to provide about 15 kilowatts of power. Today’s launch was the second Block 5 Falcon 9 flight in history and the 12th of any variant in 2018. Overall, SpaceX has launched 13 rockets this year (including the maiden flight of the Falcon Heavy in February 2018) and is expect to launch nearly as many before the year concludes. The next Falcon 9 launch is currently expected to occur at 4:39 a.m. PDT (7:39 a.m. EDT / 11:39 GMT) July 25, 2018, at SpaceX’s West Coast launch pad in Vandenberg Air Force Base, California. That flight will see the launch of the Iridium-7 mission and its 10 Iridium NEXT satellites.